As you may be aware already, I love Cave Story. This video is of the WarioWare D.I.Y. microgame that Pixel, genius behind Cave Story, has made available to download. The Ikachan microgame is based on a mechanic from a PC game Pixel released in 2000, which shares its name. Based on a mechanic from that older game, you have to tell the three young squid when to go hide in the clamshell which matches their color. Then, sometimes when you're successful, a cat in a bathing suit wearing a snorkeling mask swims past. It's exactly the sort of thing you would expect. 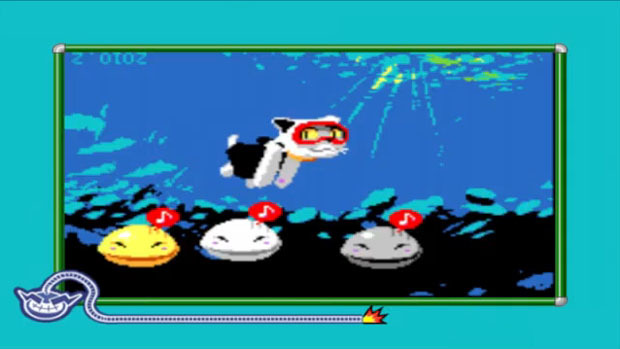 You can download Ikachan and play it for yourself through WarioWare D.I.Y. right now.